Not that long ago Echoterra’s guitarist Yan Leviathan posted on the band’s Facebook page how, inspired by watching ‘High Fidelity’ on TV, he missed the good old days of saving up his pennies (well, cents) and then racing down the local record shop to see what to spend it on – a reminiscence a lot of us can relate to. Yan’s post captured the mood of days gone by, exactly as his band has with their new six-track EP. 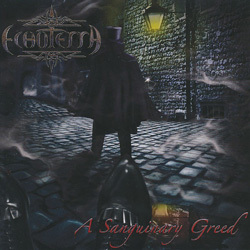 With ‘A Sanguinary Greed’ Echoterra are back in business once more with a new singer, the delightfully-named Chelsea Wrathchild, and a brooding, melancholy nod to Victorian London. Exactly a year ago Yan had emailed to say “we will be recording vocals in July/August and hopefully we'll have it out by this fall. The EP will consist of one long song, about 20 minutes, split into four parts. It will be about Jack The Ripper and his ventures. We went with that theme because the music is very Victorian-era sounding and they sort of go hand in hand.” And indeed they do, the instrumentation cleverly recreating an atmosphere of the gloom and the gas lights, the danger and the fear of the back streets of old London town. Finally released back in April, the EP took longer to complete than Yan and his bandmates Chelsea, Jonah W (keyboards) and Corey Schieder (bass) had envisioned, and took in some changes along the way too. The “one long song” – ‘A Sanguinary Greed’ itself – is now a nineteen-minute track split into four standalone parts, and ingeniously (and possibly quite uniquely) the final track of the six on offer is the whole thing sequenced as one. A new version of ‘A Different Story’ (from ‘Land Of The Midnight Sun’) completes the running order. With largely the piano/harpsichord and orchestration creating the feeling of Victoriana, the two opening cuts (‘Sirens Of Sinews And Sin’ and ‘Now I Am Become Death’, with its chilling tubular bells) in particular are extremely strong offerings. Strip away the concept, however, and you’ve still got a clutch of forceful, driving cuts brimming over with passion and verve. This is as exciting as it comes, with Chelsea’s powerhouse vocals holding their own against the fierce soundscape created around here. The majesty and texture of the material lends itself to early Nightwish being a point of reference, but that’s not to say that Echoterra are in any way clones; this band created their own identity a long while back now but have had hampered by a revolving door of singers. Hopefully this line-up will remain stable, and Echoterra can start to build on their reputation and achieve the plaudits they so richly deserve.